Farida Bashir (C.O.O) - Training House Consulting (Pvt.) 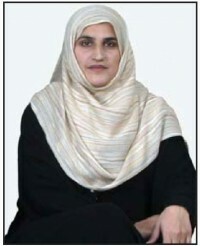 Ltd.
Farida Bashir has a vast teaching experience at different colleges/universities. She is the founder member of Training-House Consulting (Pvt.) Ltd. and heading the program development and design team. With her background as a student of MSc.Psychology, she is responsible for developing the psychometric tests, their evaluation/assessment and supporting the client in cultural and climate change programs. She has gathered an extensive experience in coaching, counselling, people management and business development. Her scope of responsibilities also includes extending assistance to Human Resource Development as a Board member of Creative Channel Marketing (Pvt.) Ltd.
As an operations expert, she first understands the customer and industry needs and then helps the client in transforming the business need into learning intervention. Her thought process and capability to structure the training material is based on the sound knowledge on human skills development process.